The Association of the U.S. Army is urging key lawmakers to ensure that the fiscal 2018 defense policy bill improves the readiness and effectiveness of the Army. 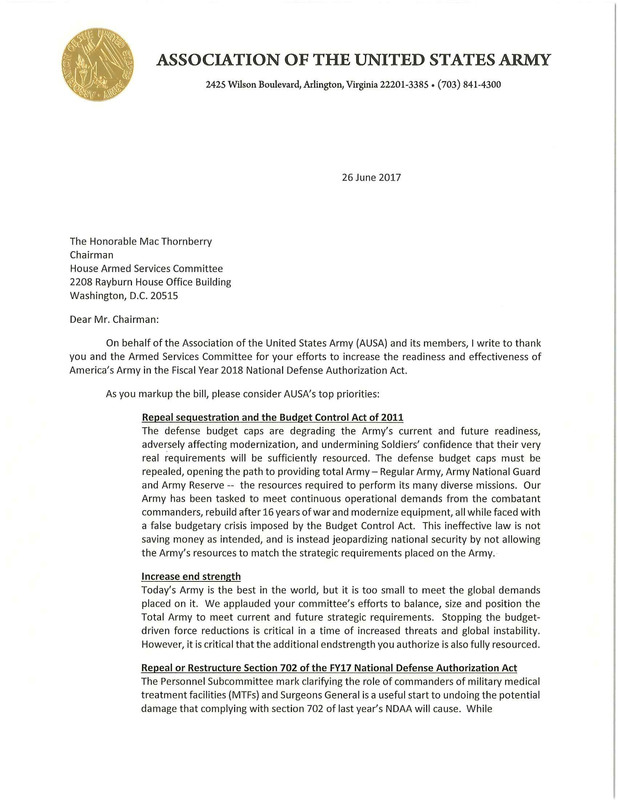 In a letter to the Republican chairmen and Democrat ranking members of the House and Senate Armed Services committees, AUSA asks for specific support on five items: troop strength, the military pay raise, weapons modernization, reform of the military health care system, and repeal of both Budget Control Act spending caps and the sequestration process that threatens to cut Army spending if Congress and the White House fail to agree on a budget. 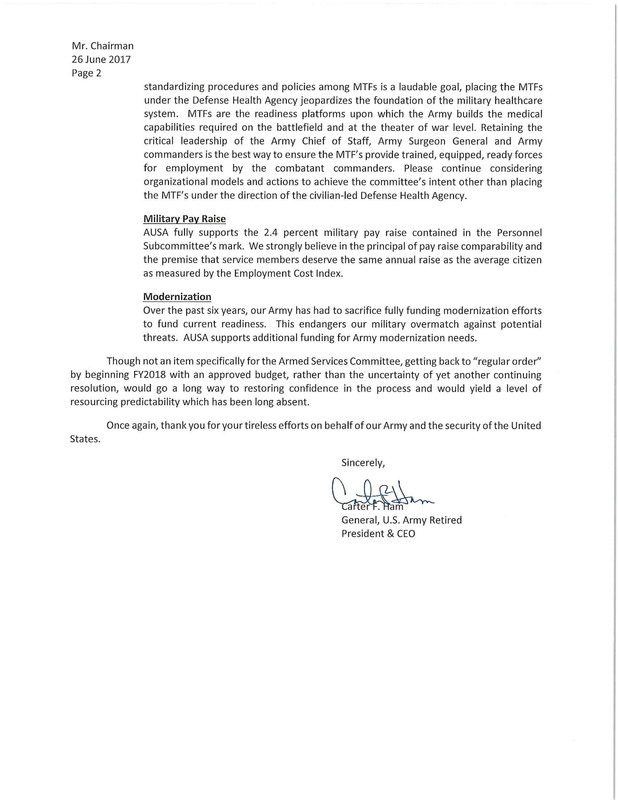 The letter comes from retired Army Gen. Carter F. Ham, AUSA president and CEO, who makes an additional plea for Congress to restore confidence and predictability in the budget process. AUSA’s views were sent to Congress as the House and Senate Armed Services committees begin work on the National Defense Authorization Act for Fiscal Year 2018, which sets policy. Before them is a Trump administration request to keep Total Army personnel strength at 1,018,000, with 476,000 Regular Army, 343,000 Army National Guard and 199,000 Army Reserve soldiers. 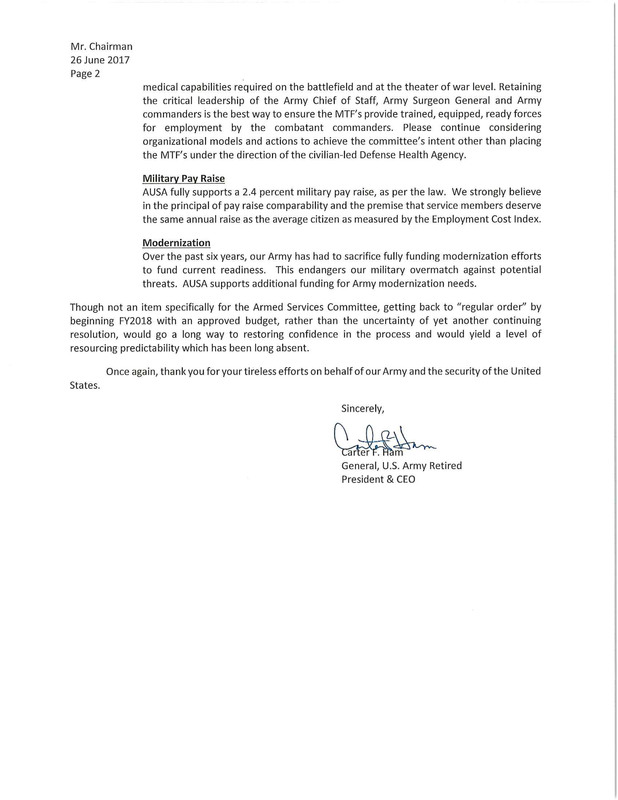 The committees also have in hand a request from Army Chief of Staff Gen. Mark A. Milley for an additional 17,000 soldiers, with 10,000 devoted to the Regular Army, 4,000 to the Army Guard and 3,000 to the Army Reserve.